More than 500,000 people have been killed by firearms in Brazil between 1979 and 2003, according to a new report by the United Nations. 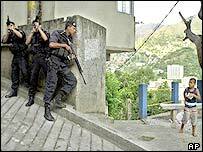 The study found that there were more gun-related killings in Brazil than in most war zones. Guns are the single biggest cause of death among young people in the Latin American nation, the organisation says. The UN has urged lawmakers to approve plans for a referendum in October on whether to ban the sale of firearms. The UN and disarmament groups are using shocking statistics to put pressure on Brazil's parliamentarians. The report's headline figure is that more than half a million Brazilians died from gun-inflicted injuries in the past 24 years. That is more than four times the number of deaths recorded in the Arab-Israeli conflict during the past 50 years. Nearly half of those who died in Brazil were aged between 15 and 24. The government wants to stage a referendum on whether to ban the sale of guns. For the poll to go ahead in October, lawmakers must approve the plan by the end of this month. In the face of heavy lobbying by Brazil's arms industry, a parliamentary vote on the matter has been postponed several times. More positively, the government argues there is a public mood for change. Recent legislation puts strict limits on the number of people authorised to carry guns. Over the past year, more than 300,000 weapons have been handed into the police in return for cash as part of a pioneering disarmament scheme.